Rob Rock is back with his third solo release, Holy Hell. From Rob's days in M.A.R.S., Joshua, Axel Rudi Pell, Warrior, and of course through Impellitteri, I have never disliked anything Rob has associated himself with. This album only confirms to me that leaving Impellitteri to form his own band was the best circumstance for Rob. Rob has certainly done a fine job tailoring his band to suit his wonderful vocal delivery. Hard, driving riffs that from time to time incorporate a hard rock vibe, but never lose their catchy, melodic qualities are what's on tap for us with Holy Hell. This recipe allows Rob to belt out the lyrics with passion, energy, and infectiousness that have made him one of the most appreciated vocalist in metal. While listening to Holy Hell, you'll surely notice the intense and varied drumming style. You won't hear any filler beats or lazy drum lines. Instead, you'll hear some intense drum work that really gives the songs an extra kick. Bobby Jarzombeck is the man behind the kit to thank for this. Most of you are familiar with his work in Halford, while Riot fans will recognize his name as well. Bobby delivers the goods in a big way on this album. Not to take a back seat to the outstanding drum work, the riffing on this album is downright nasty. Each of the songs is carried by a central, thunderous riff. From the opening 5 seconds to Slayer of Souls, you know this album is going to be a riff fest. Even tracks such as Calling Angels and I'm A Warrior that have some hard rock leanings feature some big riffs and well placed, well played solos. Speaking of I'm a Warrior, Impellitteri fans will immediately recognize this track from the Answer to the Master album. I'm a Warrior is essentially a redone version of Warrior from Answer to the Master. The structure of the song remains unchanged; however there are 2 major differences. First, quantity and intensity of the riffs has increased dramatically. Second, the harmony vocals aren't as "happy" as the Impellitteri version; they are more intense and heavy. 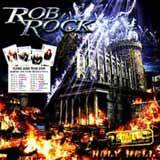 What Rob has done is transform a cool hard rock song in to a meaty, heavy metal anthem. I'm not normally a fan of updating old songs, but Rob has actually improved the original in this case. Having said that, I would say the comparison between Answer to the Master's Warrior and Holy Hell's I'm a Warrior sums up quite nicely how Rob has progressed from his first solo album, Eye of the Hurricane to this one. Eye of the Hurricane had a decidedly hard rock vibe to it. Eyes of Eternity saw Rob increase the heaviness, and Holy Hell ups the ante once again. Songs based on heavy riffs, thundering drum work, and of course Rob's melodic and powerful vocals make this a heavy metal gem. If there is a complaint to make about this album, it is the ultra corny ballad, I'll be Waiting for You. Sure it's easy for metal heads to bust on a ballad, but I do like good ballads. Unfortunately, I'll be Waiting for You isn't one of them. Some backing vocals or extra guitar textures may have helped, but somehow, this track just comes across far too corny for my liking. On the other end of the table, Move On, the final track is a good ballad. That may have something to do with that Tobias Sammet making a guest appearance on this track, singing duet with Rob. This is a nice way to end the album. Two emotional and outstanding vocal performances are backed by a nice melodic line and strong musical performances. Although one track didn't come to my liking, I would safely classify the other nine songs as killers. That's right, the quality of the remaining songs never diminishes; from the first beat of Slayer of Souls to the final note of Move On. As easily predicted, Rob's voice is in fine form, but the addition of Bobby Jarzombeck on drums and the impressively abundant heavy riffs of Carljohan Grimmark really helps to drive these songs home; arguably the most intense are hard hitting of Rob's career. I can't be sure, but I would guess that Roy Z. is again involved with this release. Rob has worked with Roy in the past, and the sound quality of this album is again fantastic, so I suspect that Roy is somehow involved in the production of this album. Rob Rock continues to amaze me with each album that his involves himself with. When Rob left Impellitteri after the Crunch album, I was a bit disappointed. However, Rob has taken his solo career to a level that is far beyond where Impellitteri was when Rob left the band. By surrounding himself with talented musicians, Rob has created a formidable force in the traditional heavy metal genre. Update for October 3, 2005: Candlelight Records (USA) released this album September 20, 2005. Check out Rob's websiet for additional information (link above).